After you have run the model, there are three ways to visualize the outputs. 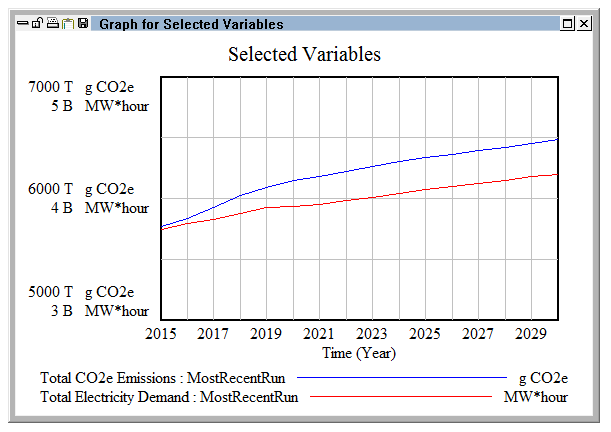 You may rely on the set of graphs that are built into the Energy Policy Simulator (EPS) (which appear on various sheets of the model), you may generate graphs of any variable using Vensim, or you may copy tabular data and import them into another program, such as a spreadsheet, before graphing them there. Once the model has been run, the data from the topmost currently-loaded run (generally the most recent run) will always be shown in the built-in graphs. No special technique or controls are involved in analyzing the data on the built-in graphs. It may be helpful to zoom in on some of them. This can be done by holding down the “control” key and rolling the mouse wheel up (while the mouse is hovering over the main view in Vensim Model Reader). Navigate to the “Cumulators” sheet and scroll to the top left. 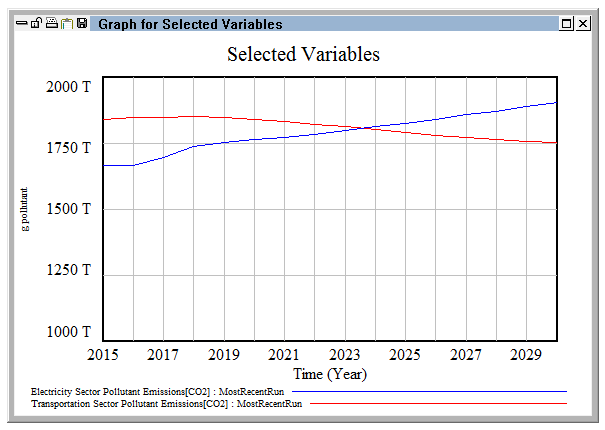 Click once on the “Total CO2e Emissions” variable to make it the active variable. Then, click the “Graph” button on the left side of the screen. 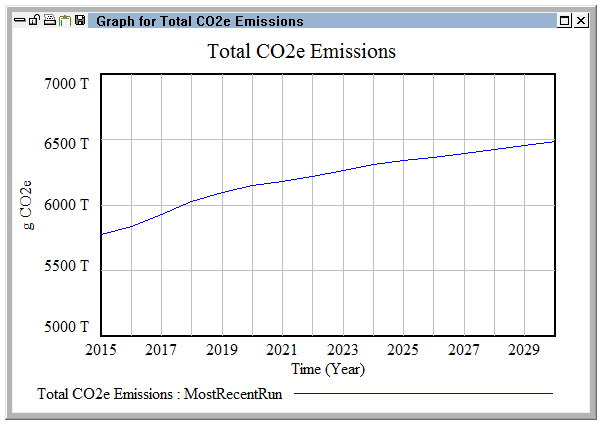 A graph showing total CO2e emissions appears in an output window, as shown below. You can drag any edge to resize this window. Five small buttons in the upper left allow you to close the window, lock the window (prevent it from being closed), print the graph, copy the graph to the clipboard, or save the graph as a file. If you instead see a view with three boxes (labeled “Subranges” “Available Elements” and “Selected Elements”), then you are in the “Full” view. Click the “Simple” button in the lower right to switch the Pollutants tab to simple view, and it will look like the screenshot above. You may also include more than one variable on the same graph. 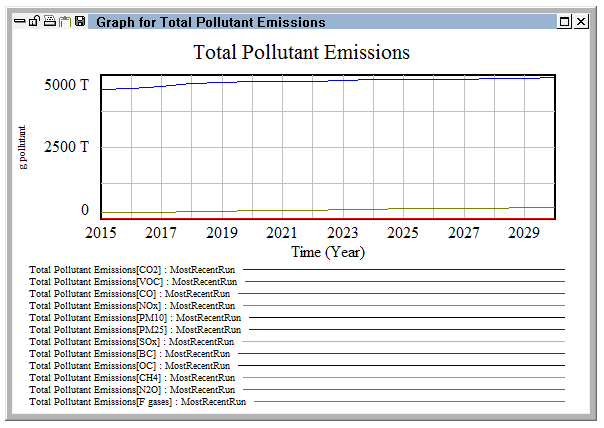 Open the Subscripts window, ensure the “Pollutants” tab is selected, and click the “None” button to deselect all the pollutants. 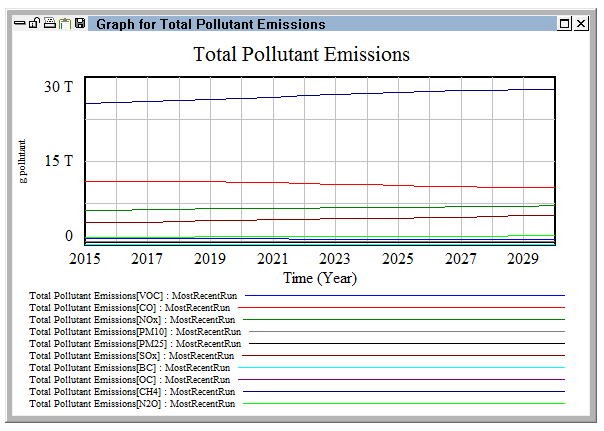 Then click on “CO2” to select only that pollutant. Close the subscripts window. This method only works if the two variables are on the same sheet. If you select a new variable that is on a different sheet from the variable you last selected, even if you hold shift, the selected variable(s) on the inactive sheet will not be included in the graph. Graphs generated on command in Vensim Model Reader can be good for getting a quick sense of a variable’s behavior, but the graphs seldom look very good and are not customizable. Often, it is best to copy the data in tabular form and graph it in a program that provides more options and produces nicer-looking output, such as Microsoft Excel or another spreadsheet program. To do this, select one or more variables, then click on the “Table” button on the left side of the screen. You can include variables on more than one Vensim sheet in the same table, even though variables on non-active sheets will not be included in a table if you select a variable on a new sheet before clicking the “Table” button. Instead, add the variables to the table sequentially, without closing the table in between variables. For example, select one or more variables on the Cumulators tab, click the “Table” button, and then left-click in the main Vensim window. The table vanishes, but it has not been closed- it is simply behind the main Vensim window. Now, switch to another sheet. Select one or more variables and click the “Table” button. The existing table will be brought to the front and the selected variables will be added to the bottom of the table. Once you have the variables you want in the table, click the fourth small button in the upper left corner of the Table window, which copies the table data to the clipboard (as tab-separated values). Now, open the program you wish to use for analysis or graphing, such as a spreadsheet program, and paste the data in from the clipboard. If your analysis or graphing program will not accept pasted data directly, you can instead use the fifth button in the Table window to save the data as a text file (again, as tab-separated values), then open that text file in your program. The following screenshot points out the location of these two buttons.